Some musicians work like dogs to perfect their sonic signatures and find the most distinctive part of their sound, then massage it until it shines like a polished gem; others just fall into their talent so naturally it’s as if their sound grew on a tree and was simply plucked for the taking. Not fair – we know – but we’re so thankful when such artists grace our stage. When it comes to their infamous vocal harmonies, Fleet Foxes definitely fall into the latter category – Robin Pecknold and his bandmates sound as if they were born to sing together, as their recent ACL taping last Friday (10/7) proved. 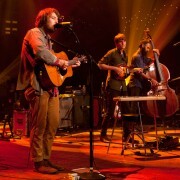 The Fleet Foxes made the trek back to Austin for this special taping and even Pecknold’s cold couldn’t dull the edges of their signature harmony blend. If you caught the show you probably noticed he was medicating his throat with tea between songs – no matter, the band still sounded incredible every time. Frontloading the set with tunes from the latest LP Helplessness Blues, the band indulged its atmospheric acid folk side with the soaring “Sim Sala Bim” and the ambitious “The Shrine/An Argument,” whose sweeping acoustica and churning electricity in the second got spiked by multi-instrumentalist/MVP Morgan Henderson’s skronking bass clarinet. On the downhill side of the set, the group performed a gorgeous take on “Helplessness Blues,” — augmented by Henderson’s mbira-equipped 12-string guitar (AKA the poor man’s hammer dulcimer) — then transitioned into the band into the second half of the show, which leaned most heavily on the melodic folk/pop of the band’s first album. The lights in our studio were magical during “White Winter Hymnal” making the band appear to glow. From the Sun Giant EP we heard “Ragged Wood” and “Mykonos” fill ACL Live at the Moody Theater to the rooftop with sweet melodies – not to mention our great fans harmoniously singing along. But don’t take our word for it – you can check out what other fine folks said about the show on austin.culturemap.com and brooklynvegan.com. And on January 21, you’ll be able to see – and, most importantly, hear – the set for yourselves. We’ll be pairing Fleet Foxes with fellow traveler Joanna Newsom – don’t miss it! The two last tapings of season 37 are Lykke Li and Wilco. Stay tuned to our blog for ticket giveaways!